Which of Taylor Swift’s Many Concert Guest Stars Are Truly Her BFFs? 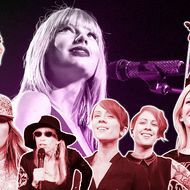 One of the highlights of Taylor Swift’s Red Tour, which has been crisscrossing the country since March, has been each night’s special guest: In every city, she has brought out a different unannounced musician to duet on one of his or her classic songs. But Taylor is quick to frame this as far more than just a professional booking; this is something deeper: She usually introduces her guest as her good friend, sometimes best friend! We know Taylor has many, many friends (stadiums are filled with her besties! ), but how close is she really with this tour’s special guests? We took to the fan-shot YouTube evidence to figure it out. Nelly’s been having a quite a lucrative time getting into bed (or, more accurately, vehicles) with all sorts of country artists this year. Florida Georgia Line’s “Cruise” (Remix) was reignited with Nelly’s hip-hop addition — and we are all aware of how much Taylor loves that song. Nelly joined her in St. Louis to perform his pre-“Cruise” comeback hit “Hey Porsche,” and they jumped to the beat alongside each other. BFF Rating: Pre-“Cruise”? Nelly would definitely let Taylor ride shotgun in the Porsche. Post-“Cruise”? They’re going on a cruise. A really nice one. If you’ve ever been inside of a Duane Reade, you know all the words to Train’s “Drive By.” Why Taylor Swift subjected her Newark audience to yet another rendition, I cannot say, but Taylor said that Train is one of her “favorite all time band[s],” so there he was. Their chemistry was a bit strange: Her theatrics got in the way of his attempts at a connection. Taylor’s a longtime Fall Out Boy fan; she did an acoustic cover of their “Sugar, We’re Going Down” during her Speak Now tour. When Stump joined her in New Jersey, it appeared that she kept trying to make contact, but Stump kept things completely professional. She even tries to get the audience involved, having them raise their glowing devices for his approval. He is not impressed. BFF Rating: Borderline Mean Girls; so un-fetch they might just start dating. BFF Rating: These two are already headed to the mall. When Taylor Swift gets a song stuck in her head, she doesn’t head to karaoke, she invites the singer to perform with her at the Staples Center. Thus, Cher Lloyd and “Want U Back”: Despite having a foot-plus height differential, the two are wonderfully in sync. BFF Rating: When Taylor heads to London next, she’ll be calling the Royal Baby and Cher. That night Taylor had two guests! She also brought out Sara Bareilles — whose song “Brave” is objectively wonderful, but also gave Taylor the opportunity give a maybe dig at Katy Perry, whose new single sounds like “Brave” and whose current boyfriend is Taylor’s ex, John Mayer. “This song is is so beautifully written. It’s so original,” she said. Ha-ha-ha. BFF Rating: Taylor already put her number into Sara’s iPhone. Can Tegan and Sara let Taylor into their twin duo? It could be Tegan and Sara and Taylor. Or Taylor and Tegan and Sara. It’s all wishful thinking anyhow, because even though Taylor tried her best to get “Closer” to the brunettes, they would just not join her in jumping up and down. BFF Rating: Many unanswered texts lay in Taylor’s future. Both blonde, both whimsical: “She’s one of my favorite artists. She’s also one of my friends.” Emphasis on friends. And I buy it! Their matching black high-waisted shorts speak volumes. BFF Rating: Someone warn Selena Gomez. Introducing someone as a singer you loved when you were “really little” is not the best way to get them to be your BFF. They might feel old! And when Jennifer Lopez breaks out her signature moves while Taylor bobs to the side, it doesn’t feel like the two would have much to discuss offstage, other than maybe their matching bedazzled outfits? BFF Rating: Your BFF Meter may deceive you here. While these two didn’t have ideal onstage chemistry, they appear to be teaming up for an actual song! May they split a BFF heart necklace and go by J.Lo and Tay.Lo. Taylor Swift’s Live Special Guests: True BFFs?